In this section and the upcoming ones, we will take a closer look at the states and how they are handled for each of the three basic protocols TCP, UDP and ICMP. Also, we will take a closer look at how connections are handled per default, if they can not be classified as either of these three protocols. We have chosen to start out with the TCP protocol since it is a stateful protocol in itself, and has a lot of interesting details with regard to the state machine in iptables. A TCP connection is always initiated with the 3-way handshake, which establishes and negotiates the actual connection over which data will be sent. The whole session is begun with a SYN packet, then a SYN/ACK packet and finally an ACK packet to acknowledge the whole session establishment. At this point the connection is established and able to start sending data. The big problem is, how does connection tracking hook up into this? Quite simply really. As far as the user is concerned, connection tracking works basically the same for all connection types. Have a look at the picture below to see exactly what state the stream enters during the different stages of the connection. As you can see, the connection tracking code does not really follow the flow of the TCP connection, from the users viewpoint. Once it has seen one packet(the SYN), it considers the connection as NEW. Once it sees the return packet(SYN/ACK), it considers the connection as ESTABLISHED. If you think about this a second, you will understand why. With this particular implementation, you can allow NEW and ESTABLISHED packets to leave your local network, only allow ESTABLISHED connections back, and that will work perfectly. Conversely, if the connection tracking machine were to consider the whole connection establishment as NEW, we would never really be able to stop outside connections to our local network, since we would have to allow NEW packets back in again. To make things more complicated, there is a number of other internal states that are used for TCP connections inside the kernel, but which are not available for us in User-land. Roughly, they follow the state standards specified within RFC 793 - Transmission Control Protocol at page 21-23. We will consider these in more detail further along in this section. As you can see, it is really quite simple, seen from the user's point of view. However, looking at the whole construction from the kernel's point of view, it's a little more difficult. Let's look at an example. Consider exactly how the connection states change in the /proc/net/ip_conntrack table. The first state is reported upon receipt of the first SYN packet in a connection. As you can see from the above entry, we have a precise state in which a SYN packet has been sent, (the SYN_SENT flag is set), and to which as yet no reply has been sent (witness the [UNREPLIED] flag). The next internal state will be reached when we see another packet in the other direction. Now we have received a corresponding SYN/ACK in return. As soon as this packet has been received, the state changes once again, this time to SYN_RECV. SYN_RECV tells us that the original SYN was delivered correctly and that the SYN/ACK return packet also got through the firewall properly. Moreover, this connection tracking entry has now seen traffic in both directions and is hence considered as having been replied to. This is not explicit, but rather assumed, as was the [UNREPLIED] flag above. The final step will be reached once we have seen the final ACK in the 3-way handshake. 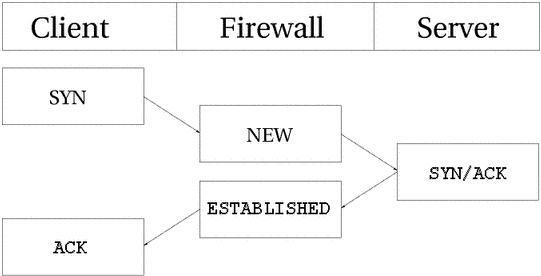 In the last example, we have gotten the final ACK in the 3-way handshake and the connection has entered the ESTABLISHED state, as far as the internal mechanisms of iptables are aware. After a few more packets, the connection will also become [ASSURED], as shown in the introduction section of this chapter. 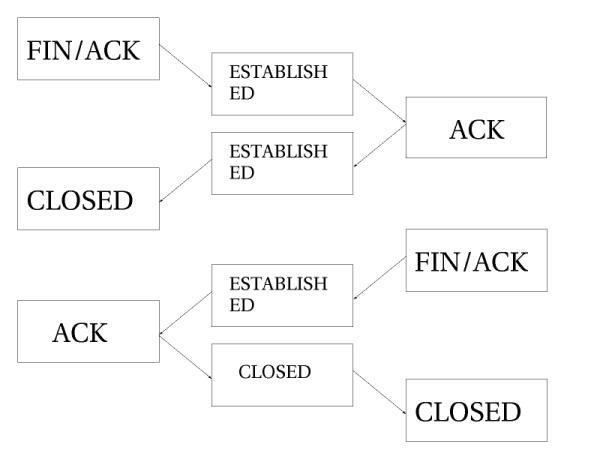 When a TCP connection is closed down, it is done in the following way and takes the following states. As you can see, the connection is never really closed until the last ACK is sent. Do note that this picture only describes how it is closed down under normal circumstances. A connection may also, for example, be closed by sending a RST(reset), if the connection were to be refused. In this case, the connection would be closed down after a predetermined time. When the TCP connection has been closed down, the connection enters the TIME_WAIT state, which is per default set to 2 minutes. This is used so that all packets that have gotten out of order can still get through our rule-set, even after the connection has already closed. This is used as a kind of buffer time so that packets that have gotten stuck in one or another congested router can still get to the firewall, or to the other end of the connection. If the connection is reset by a RST packet, the state is changed to CLOSE. This means that the connection per default have 10 seconds before the whole connection is definitely closed down. RST packets are not acknowledged in any sense, and will break the connection directly. There are also other states than the ones we have told you about so far. Here is the complete list of possible states that a TCP stream may take, and their timeout values. These values are most definitely not absolute. They may change with kernel revisions, and they may also be changed via the proc file-system in the /proc/sys/net/ipv4/netfilter/ip_ct_tcp_* variables. The default values should, however, be fairly well established in practice. These values are set in jiffies (or 1/100th parts of seconds), so 3000 means 30 seconds. Also note that the User-land side of the state machine does not look at TCP flags set in the TCP packets. This is generally bad, since you may want to allow packets in the NEW state to get through the firewall, but when you specify the NEW flag, you will in most cases mean SYN packets. This is not what happens with the current state implementation; instead, even a packet with no bit set or an ACK flag, will count as NEW and if you match on NEW packets. This can be used for redundant firewalling and so on, but it is generally extremely bad on your home network, where you only have a single firewall. To get around this behavior, you could use the command explained in the State NEW packets but no SYN bit set section of the Common problems and questions appendix. Another way is to install the tcp-window-tracking extension from patch-o-matic, which will make the firewall able to track states depending on the TCP window settings.